Grizzly bears (Ursus arctos) are a major representative of the wild. Grizzly bears usually weigh 136-680 kilograms and the males are usually larger in size . They belong to the same family as polar bears and black bears . The correct scientific name is brown bear, however, they are referred as grizzlies due to distinct lighter colour hair on their back which gives them “grizzled” appearance . Grizzly bears have a hump on their shoulders. This is due to their mass of muscle which is specifically designed for digging . It is easy to distinguish black bears and grizzlies by looking at their faces: black bears have straight-faced profile while grizzlies have a dished-face profile. In the colour range, Grizzlies are usually dark brown, but can vary from light cream colour to black which is mainly affected by their genetics . In addition, grizzlies have relatively longer claws than other species of bears, designed for digging. Grizzlies can adapt to cold environment with the help of their thick fur. Also, their long claws and powerful shoulders help them create winter dens and scavenge for food  . There are around 15,000 Grizzly bear in British Columbia, around a quarter of the entire North American population. Their habitat quality and population density varies across the province. They are a symbol of ecological integrity and represents part of the natural beauty. Grizzlies are good indicators of healthy ecosystems . They are slow-reproducing mammals that are sensitive to changes in the environment and have high mortality risks associated with human activities. (They have strong cultural and social power. Most people feel enriched and connected with nature when seeing bears, or knowing they are there. Canadians recognize grizzlies as a national treasure. Many First Nation communities recognize as grizzlies part of their culture and they claim grizzlies as a symbol of power and fearless. Grizzly bears play an incredibly important ecological role, and are considered a keystone species because of the necessity of their presence for healthy ecosystem functioning. These bears are noticeably important food chain regulators, as they have strong top-down effects on their direct prey and associated species . Their removal can cause trophic cascades  to the extent that was seen with wolves in Yellowstone National Park. Bears and wolves are the main large predators in the north-west ecosystem, and strongly regulate moose populations . Without the regulation of bears and wolves, moose populations would boom and decimate the local vegetation, rapidly decreasing biodiversity and food sources for other herbivores, affecting the entire ecosystem. Besides from herbivore booms, loss of large predators can cause changes in prey behaviour and changes in the diets/behaviour of smaller meso-carnivores in the region . Grizzly bears consume mammals, fish, invertebrates, and plants, thus their ecological effects extend to all areas of the British Columbian ecosystem, including both terrestrial and aquatic realms. Grizzly bears are omnivores and consume both meat and vegetation. Bears will hunt animals, which provide a higher energy pay-off, when available or populations are high enough that they are energetically efficient to hunt, mainly in the summer. In the fall they typically dig for roots  and in the spring they scavenge for ripening fruits and berries . Bears are part of a symbiotic relationship with the plants they eat in the spring, as they gain energy and nutrients from eating the fruit and then disperse seeds for the plants . Specifically, grizzly bears have been recorded to be important seed dispersers for blueberries and buffalo berries, although they perform this important function for a wide variety of plant species. When bears disperse seeds after ingestion they release them in their feces, which provides a nutrient rich environment from which they grow. Thus grizzly bears play an important role not only in seed dispersal but also in creating an optimal environment for seed germination. This encourages plant growth and dispersal, which increases biodiversity and vegetation biomass for other herbivore’s consumption. In British Columbia, grizzly bears feed on adult salmon when they return to their original rivers and streams to reproduce. Pacific salmon play an important role in the transfer of nutrients and energy from the marine to terrestrial environment . Grizzly bears facilitate this by dragging salmon carcasses up from the river onto the land where they are consumed by the bears themselves and other terrestrial predators inserting an energy source into the terrestrial food web. As well the salmon carcasses decompose on the land, releasing nutrients (specifically high levels nitrogen) into the surrounding soils. These nutrients are necessary for productive soils that encourage plant growth, in turn facilitating high biodiversity. As well, as grizzly bears scavenge for roots and tubers in the fall they dig and turn up the soil. Homogenized soil is a major factor in unproductive land, thus turning up the soil increases productivity of the land, in the same manner that farmers will regularly till their soil. Increasing the productivity of the soil thus again increases vegetative biomass and facilitates plants biodiversity, which supports further animal biodiversity of both herbivores and predators. If there is one symbol of Canada’s remaining wilderness, it is the grizzly bear (Ursus arctos). As human population has expanded, the Grizzly Bear’s habitat has shrunk. 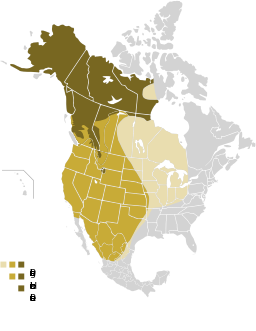 Once found across most of western and northern north america, grizzly bears now can only survive in the western sliver of alberta, and most of British Columbia, alaska and the Canadian north . Fragmentation (=Greater potential for human-bear interactions and conflicts) As a large carnivores, grizzly bears in particular require special consideration to occupy the top of the biotic pyramid for their thrive. However, from the BC government statistics, we can learn that the habitats of grizzly bears are separated into three main groups: Extirpated, Threatened, and Viable. Current habitat quality and population density are affected by human-caused disturbance, the most negative one is road construction. This is the main factor to isolate grizzly bears into different groups further affect their movement in nature. . Additionally, resource-based and extractive land use activities (e.g. logging, gas, oil and mineral exploration and extraction, hydro projects, recreational and backcountry uses) which contribute to the extremely bad fragmentation, loss or significant alteration of critical habitat features and food sources. . What’s worse, the long-term negative effect is happening based on the fragmentation, long period scale makes genetic fragmentation spread over in the southern parts of its range, where some populations are increasingly isolated and subject to demographic stochasticity . Though grizzly bears are descended from carnivore ancestors, Grizzly Bear are basically giant omnivores. Key food sources are those rich in both animal and plant protein. In the spring, after emergence from denning, this species targets meadows and vegetated shorelines where it can graze on abundant supplies of high protein sedge and grass species. Throughout the summer foraging includes berries, insects, small mammals and some ungulates (e.g. elk, caribou and moose fawns). In the fall, returning salmon form a key part of the diet which continues to be supplemented with berries and vegetation. Bears spend most of their time perusing a patchwork of habitats throughout the year, feeding on vegetation, insects and other more reliable, though lower calorie food sources, mostly in spring and summer. Plant foods make up the majority of a bear’s diet – sometimes as much as 90 per cent. More importantly, grizzly bears will chase after fish and meat to survive in cold seasons. However, the food supply in decreasing in BC. it is an optimization process and should be targeted especially at those populations that have identifiable conservation concerns. As the food supply diminished, the reproductive rate halved (to the lowest known in North America), and the population declined precipitously (2–5%/year). Since 1977, the earliest date that accurate records were kept, until the end of 2009, resident and non-resident trophy hunters have killed at least 9,484 grizzly bears. Since 2004 alone (when revisions were made to provincial population estimates), hunters killed 1,773 grizzly bears (1,174 males and 593 females, as well as six unidenti ed individuals) in B.C. 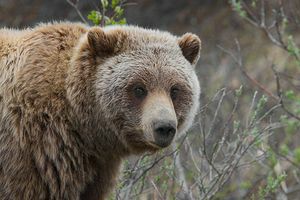 Many British Columbia people are concerned about the ethics of trophy hunting of apex species such as grizzly, and others are concerned that overhunting threatens grizzly bears’ continued viability in the province. But, the most important thing is to protect the grizzly bear in a sustainable way to thrive them in nature without or with lower threats and disturbance. That is the main theme and religious faith of trophy hunt. What other threats become apparent regarding grizzly bear conservation is viewed through the lens of other disciplines and professions? What special expertise, resources, or theoretical orientations might others bring to help us better understand the threat to grizzly bear population in BC? Grizzly bear western population is in great danger now, based on the federal status from SARA and COSEMIC, both indicate grizzly bear is currently facing distinction. At the May, 2012 Wildlife Species Assessment Meeting of COSEWIC, a new designatable unit structure was approved for the grizzly bear (Ungava population and Western population). The Ungava Bay population of the grizzly bear was assessed as Extinct. Although Ungava Bay is in Northeast part of Canada, but, the BC grizzly bear is suffering similar situation with intensive and unstoppable threats if BC government cannot implement sufficient and efficient policies and laws. As we known, different nature movements happen in different ways based on natural conditions, in the central and northern parts of the range where there has been significantly less human influence, bear movements were more extensive and individual genotypes follow an isolation-by-distance pattern, indicating substantial gene flow within a continuously distributed population. Furthermore, COSEWIC’s Species Specialists Subcommittees (SSCs) provide expertise to the Committee. Each SSC is led by two Co-chairs and members are experts in relevant fields, have broad knowledge and experience, and have a demonstrated knowledge of wildlife conservation. For example, SSC meetings take place annually in different locations in Canada or by teleconference held once or twice a year . Observers are invited to attend and public information sessions may also take place that citizens can receive more general information Based on practical experience and local experiments, giving out reliable data and resources as reference for political policy implementations. If people can base on grizzly bears’ natural living characteristics, our implementation (or protection) would last longer. ↑ 3.03.13.23.33.43.5 Mattson, D. (2015) All grizzly: Morphology. Retrieved from: https://www.allgrizzly.org/bio Ministry of Environment, (2012) Grizzly bear population status in BC. Unpublished Report. 60 pg.